You’re probably familiar with the Category widget in WordPress. Recently, one of our readers asked us if it was possible to display recent posts in a drop down as well. 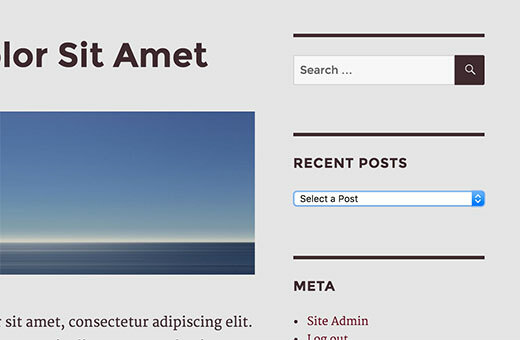 In this article, we will show you how to show recent posts as a drop down in WordPress. Why and Who Needs Recent Posts in Drop Down? WordPress comes with a built-in recent posts widget that you can add to any sidebar or widget ready area. This widget simply displays a list of recent posts, and you can choose the number of posts you want to show. But if you want to show more than 5-10 posts, then the list will take a lot of space in your sidebar. Some WordPress users may need a compact way to display recent posts. In that case, using drop downs or collapsible lists can help you save space. 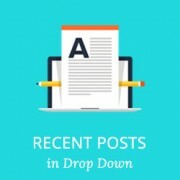 Let’s take a look at couple of different ways to show recent posts as a drop down menu in WordPress. This method uses the built-in wp_get_recent_posts function. All you need to do is copy and paste the following code in your theme’s functions.php file or a site-specific plugin. The above method simply lists your recent posts in a drop down form. Another way to save space is by adding a collapsible list of recent posts which expands when users click on it. First thing you need to do is install and activate the Collapse-O-Matic plugin. It works out of the box, and there are no settings for you to configure. The plugin simply allows you to show anything in a collapsible menu using a shortcode. Before we use this plugin, we need a way to easily show recent posts anywhere we want. Simply add this code to your theme’s functions.php file or a site-specific plugin. This code simply allows you to display a list of recent posts using the shortcode [recentposts]. Now we will add our shortcode in the Collapse-O-Matic shortcode to create a collapsible list of recent posts. You can add this shortcode in a text widget, posts, or pages on your WordPress site. This is how it looked on our test site. That’s all, we hope this article helped you show recent posts as drop down in WordPress. 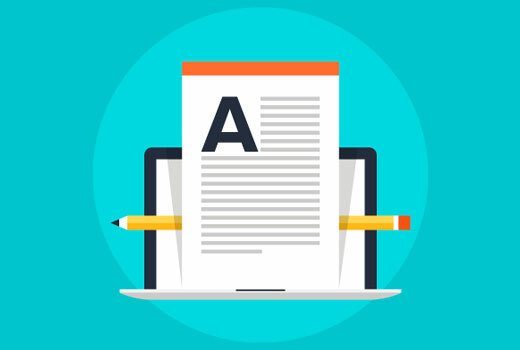 You may also want to see these 6 tips to create a killer editorial calendar in WordPress. Nice article! How can you make it by a specific category and not just all your categories? Also, can it be done alphabetical? Great tool, thanks for that! Is it possible to sort the post output in the list in alphabetical order? Its possible to show the posts dropdown with a button to submit? Very neat Stuff!! Great Read and easy to understand. It is an excellent article. Beginners like me can understand power of WordPress and its plug-ins by such articles. I would be enlightened if some articles are written to display a message on specific page and not on all posts and pages. I really like the drop-down menu of recent posts. How can I control the width of this drop down menu? It defaults too long for my sidebar.